The wings never make it to the table when I roast a chicken. Covered in cracker-crisp skin, they’re the best part, so I tear them off for myself as the cook’s reward. During a recent visit, I discovered that Rocco’s Wood Fired Pizza sells such treats by the plateful, no chicken mauling required. Marinated in lemon, herbs and spices, lighter than your deep-fried standards, the wings made me wonder why the place isn’t called Rocco’s Wood Fired Wings. I can get competitive pizza other places. Wings like that? Now I know of one. Rocco’s is a family pizza parlor that punches above its weight class. It’s a descendant of a Buffalo restaurant lineage that starts with Oliver’s and extends through Siena and 800 Maple. The long, tall space in a Transit Road strip mall is built around two massive brick ovens loaded with burning cordwood. Pizzas are paddled in and out of their hearths by white-shirted pizzaiolos as unbaked ones wait in racks for their turns. There was a steady flow of takeout boxes from the counter by the entrance. The restaurant only takes reservations for groups of eight or more, so we got a beeper for a few minutes when we visited on a snowy Saturday night. More families trooped in steadily, eventually filling the couches in the bar in the back, the big 10-seat tables next to them and the regular tables out front. Playoff football was on the wall-mounted flat-screens, and dads handled babies while their mothers got a chance to eat in relative peace. Pizzas range from $12.95 for a small margherita to $21 for large specialty pies like the arugula-topped white with pesto. Salads, sandwiches and sides cover the usual bases. Small plates ranged from a special of house-made burrata ($12.95), to tripe with mint and rapini with sausage (both $9.95). The wood-fired wings aren’t the only kind on the menu; standard fried wings are available too, in the usual denominations. There’s also a compact list of Italian red-sauce entrees like spaghetti ($14.95), eggplant ($13.95) and veal Parmesan ($19.75). I was recognized as soon as we sat down, but it didn’t seem to get our table more attention. Our server organized our dishes into rounds, starting with an Italian family salad ($12.95) and those oven-baked wings ($19.95 for 18). The salad was simple but fresh, a heaping bowl of mixed greens, cucumbers, chickpeas, shaved red onion, green olives and tomatoes, dusted with grated cheese. The crispy skin on the wings was tangy and fragrant from lemon, tipped with char, and flavorful enough to make the accompanying tomato sauce superfluous. Their unfried nature made them lighter than Buffalo wings. The burrata arrived perched on slices of crispy fried eggplant and roasted tomatoes, dressed with arugula, balsamic glaze and olive oil. The mozzarella case was milky and carried a sweet mascarpone payload that oozed when cut, a satisfying specimen. A loaf of spinach bread ($5.95) was crunchy-crusted and stuffed with cheese and spinach, not as fine as the Oliver’s version, but close enough. The arancini, a fried risotto ball, was soft to the point of being mushy and gooey with cheese. It was served over a pool of robust red sauce and topped with gremolata, an earnest effort. Another chicken dish with crispy skin to be reckoned with was the crispy chicken thighs with vinegar peppers ($15.95 for four). Marinated thighs are roasted then blasted in a convection oven until the skin crackles but the meat is tender enough to eat with a spoon. Then it’s served with sweet bell peppers cooked soft in vinegar and garlic, which contrasts well with the poultry’s lushness. I expected the “brick chicken” entree to be bone-in, skin-on, but it was chicken breast seared expertly without drying it out. The wine-fortified pan sauce soaked into the bed of chewy farro grains and blistered, soft cherry tomatoes for a heartier chicken dish, making me thankful for the grains instead of another pasta helping. Our large meatball pizza ($21), served on a well-charred wooden paddle, was excellent, as well. The toppings – meatballs, banana peppers, ricotta and mozzarella – were abundant. Its well-browned crust, including browned spots on its undercarriage, attested to the intense heat of the wood-fired oven, yet it lacked that extra degree of blistery, almost-burned notes that the greatest pizzas offer. Desserts at a family pizzeria are usually forgettable, but Rocco’s again took advantage of its lineage, serving a peanut butter pie ($7.50) transplanted from 800 Maple. Creamy and nutty with a touch of salt, it hit the spot. A sandwich of espresso ice cream and Nutella between anise-scented pizzelles ($6.50) was a crowd pleaser. A gluten-free sugar-free chocolate tart ($6.95) didn’t seem like it was missing anything at all, which is a neat trick. Dinner at Rocco’s reinforced why this restaurant doesn’t need to take reservations, for the most part. Many families looking for a good meal in the Transit Road area go there first. If the wait’s too long, they know they can always find something else down the road. 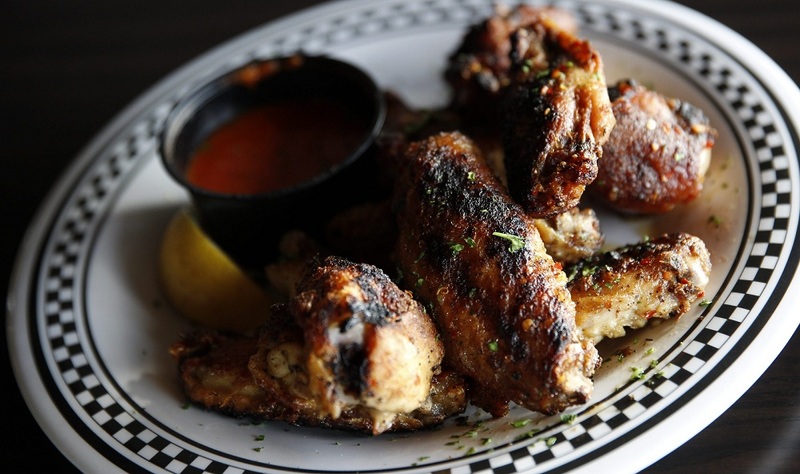 Crispy chicken wings lead parade at upscale family pizza parlor. HOURS: 11 a.m. to 10 p.m. Monday through Thursday; 11 a.m. to midnight Friday and Saturday; and noon to 9 p.m. Sunday. PRICE RANGE: Salads, sides $3.95-$17; chicken wings, $10.75-$38.95; pizzas, $12.95-$21; entrees, $13.95-$29.